Home // Newsroom // Donation Essentials // What is a Donate Life flag raising ceremony and what does it mean? National Donate Life Month is just around the corner! This month-long celebration in April honors the generosity of organ, eye and tissue donors and their families and commemorates all transplant recipients and those still waiting for a lifesaving transplant. 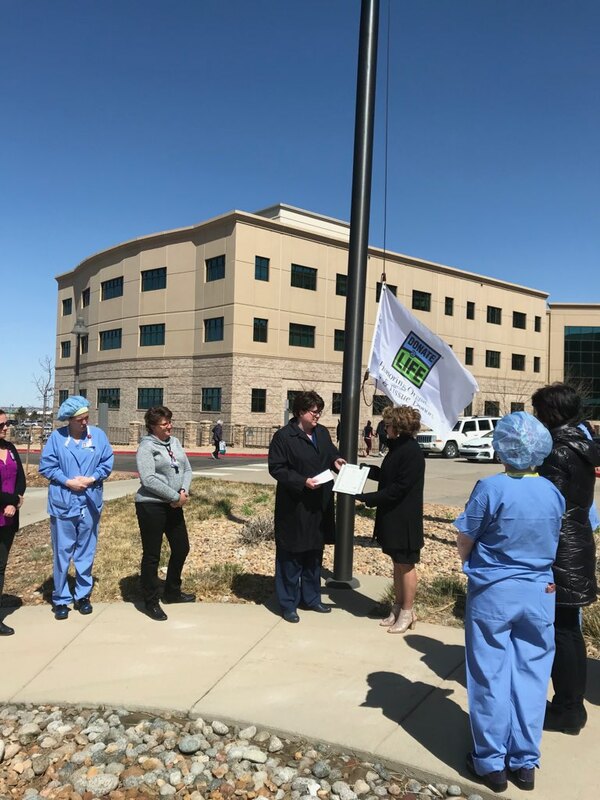 If you have never been a part of a flag raising ceremony or you have driven by a local hospital and witnessed the Donate Life flag flying on their flagpole in April, you’ve probably wondered what it means. Each year, hospitals across the United States raise Donate Life flags and fly them all month long. Donate Life flags have served as a nationwide display of unity, remembrance and hope, while honoring those touched by donation and transplantation since 2006. Beginning next week, numerous hospitals in our region will raise the Donate Life flag in ceremonial fashion. To find an event near you to attend, visit our event calendar. Each ceremony is unique to the attendees and hospital, but the display of honor and support for donation and transplantation holds true across Colorado and Wyoming. Join the celebration this year by signing up to be an organ, eye and tissue donor at Donate Life Colorado or Donate Life Wyoming. Then checkout all the other ways you can celebrate National Donate Life Month with us and #ShowYourHeart!